The ongoing persecution of LGBT asylum seekers must end! Where is the outrage? In the past two weeks, two separate reports have highlighted the ongoing persecution of LGBT asylum seekers in the United States and the United Kingdom. On October 26, Stonewall and the UK Lesbian and Gay Immigration Group, or UKLGIG, released No Safe Refuge: Experiences of LGBT Asylum Seekers in Detention. On the same day, the Center for American Progress released its finding, “ICE Officers Overwhelmingly Use Their Discretion to Detain LGBT Immigrants.” While the research of both organizations is both urgent and important and the stories are all too familiarly heartrending, the only new piece in both reports is that the abuse of LGBT asylum seekers is intensifying and expanding, and even that is not really new, since the pattern has been ongoing for some time now. Lesbian, gay, bisexual and transgender individuals travel great journeys to arrive at something like haven or sanctuary, and they are increasingly thrown into cages where they are rendered ever more vulnerable. Consider a cursory examination of the past five years. Brenda Namigadde fled Uganda in 2003 after her house was destroyed and her life was threatened … because her life partner was a woman. Namigadde fled to the United Kingdom, where she sought asylum. In 2011, she was turned down, because of insufficient proof of `being lesbian’. Namigadde was sent to Yarl’s Wood, where she awaited, in terror, to be deported to Uganda. Thanks to an international campaign and the murder of David Kato just days before her scheduled deportation flight, Brenda Namigadde’s case was re-opened. Also in 2011, Betty Tibikawa, a Ugandan lesbian who applied for asylum in the United Kingdom, was turned down and thrown in Yarl’s Wood. Betty Tibikawa’s family had disowned her. The infamous Ugandan tabloid, the Red Pepper, identified Tibikawa as lesbian, and so extended the threat to her life and well being. And she had been tortured. Having just graduated from high school, Betty Tibikawa was preparing to go to university in Kampala when three men abducted her. They took her to an abandoned building and branded her thighs with a hot iron. They left her unconscious. She remained at home, in bed, for two months. In the home of the family that then disowned her for being lesbian. Betty Tibikawa was deemed insufficiently lesbian for asylum. Jackie Nanyonjo died in Kampala, Uganda, March 8, 2013. Jackie Nanyonjo was a lesbian who fled Uganda, made it to England, and applied for asylum. Jackie Nanyonjo fought for the rights, power and dignity of women, LGBTI individuals and communities, lesbians, asylum seekers. She fought for those rights on the streets; in the cells and corridors of Yarl’s Wood; and in the airplane that took her back to Kampala. When she arrived in Kampala, she went into hiding. She didn’t contact members of the organized LGBT rights communities, most likely because of the pogroms against lesbians and gays and their organizations. And so she died in hiding. In 2014, Aidah Asaba, a Ugandan lesbian asylum seeker in England, was thrown into Yarl’s Wood, again for insufficient lesbianism. While Aidah Asaba sat in Yarl’s Wood, openly lesbian Anne Nasozzi was taken from Yarl’s Wood and deported to Uganda. 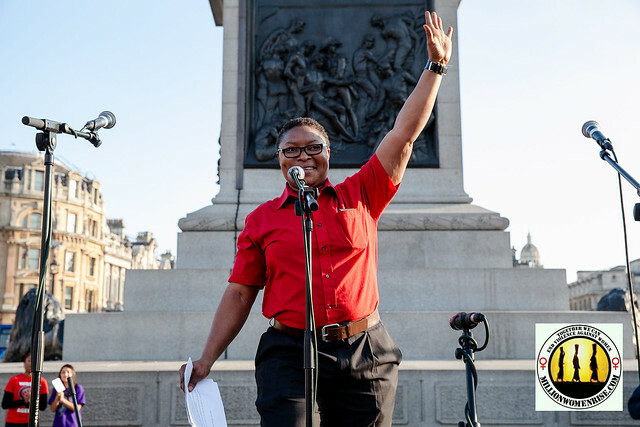 In 2014, the United Kingdom tried to crush Nigerian lesbian, feminist, asylum seeker Aderonke Apata. They threw her into Yarl’s Wood. She organized and mobilized. They tried to cast doubt on her claim of being a lesbian. She looked at them with pity, and then provided evidence. They tried to silence her. She founded Manchester Migrant Solidarity, aka MiSol, “a convergence space for migrants (including asylum seekers, economic migrants etc.) and non-migrants, offering practical and social activities for mutual support, empowerment and solidarity.” Today, Aderonke Apata is still organizing across England, surrounded by the ghosts of sisters sent off and the voices of sisters inside. The stories in the United States, such as that of Sulma Franco, a 31-year-old LGBT activist, are equally disgraceful and disturbing. Except that the State is neither disgraced nor disturbed, and therein lies the tragedy. There have been and will be reports, thoroughly researched and nothing short of tragic. And through the long trek of reports, the situation worsens. 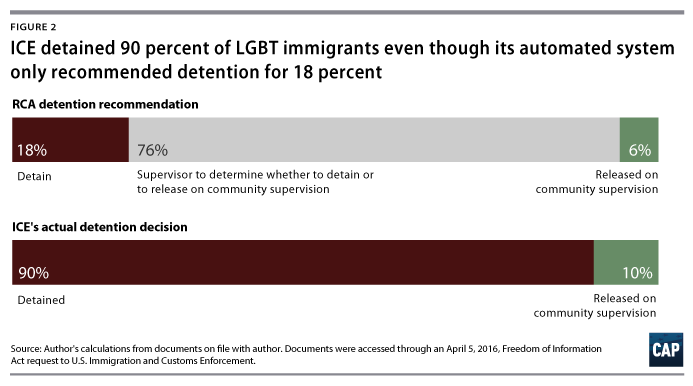 Proportionately more lesbian, gay, bi, and trans asylum seekers are incarcerated, and in raw numbers more LGBT asylum seekers are behind bars. The persecution intensifies as it expands. There is still little to no concern among the magistrates and judges, and little to less than no training among the staff, and so the violations continue, intensify and expand. Where is the outrage? Why must vulnerable people, and in particular lesbian and transgender women, go through the heroics of Aderonke Apata or Sulma Franco in order to secure a modicum of dignity and respect from the State? How many stories of torture and trauma will it take before we close this era of witch trials? #SetHerFree: We want Yarl’s Wood to close, not just today, or tomorrow, but forever! Hundreds of people showed up at Yarl’s Wood today, with one message. Shut it down now! Never open it again! Set her free! #SetHerFree. The hundreds included activists, organizers, advocates, and unusual suspects. Green Party and Conservative Party members showed up in support. 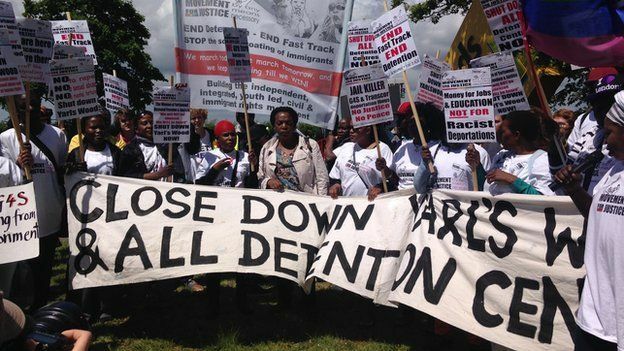 Women chanted from one side of the fence surrounding the prison, and the women inside Yarl’s Wood responded, amplifying the demand to shut it down immediately and permanently. Lively protesters successfully pulled down parts of the outside perimeter fence, to the cheering of those inside as well as outside. Action unites. As a local Conservative MP explained, 15 years ago, detention of asylum seekers was rare. Now “it’s the default.” It’s costly, ineffective, and inhumane, and that’s from a tough-on-immigration Conservative. Yarl’s Wood is supposed to be the house of the dead, a factory that churns out packets of pain, suffering, and ultimately death. But the women of Yarl’s Wood have refused to lie down and die. They have rejected the special hell slotted for them. In 2010, at the age of 16, former Yarl’s Wood prisoner Meltem Avcil began campaigning to shut it down. 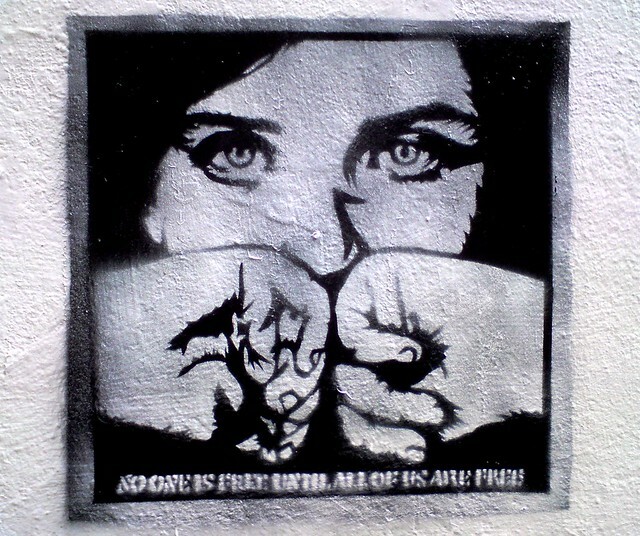 In 2007, women asylum seekers banded together to take care of each other, help one another with anti-deportation campaigns, and to publicize the particulars of being a woman asylum seeker in Britain in 2007. They formed Women Asylum Seekers Together, WAST, as a women only safe space for those threatened every second of every day, women asylum seekers. Today, eight years later, they are all over the country. Lydia Besong left Yarl’s Wood and wrote a play, How I Became an Asylum Seeker, which WAST took up and performed across the country. Nigerian lesbian feminist Aderonke Apata was dumped into Yarl’s Wood, or so they thought. She organized, founded Manchester MiSol, Manchester Migrant Solidarity, who hooked up with WAST, and today Yarl’s Wood was surrounded by chants, songs, and bodies pushing against the fence. Shut it down! Shut it down! Set her free! Not long ago, WAST formed a choir, the Nightingales, who sing of women’s rights, women’s power, women’s dreams, and they begin, but it’s only a beginning, with this: “We want Yarl’s Wood to close, not just today, or tomorrow, but forever”. Sing it loud, sing it proud, shut it down, set her free, not just today, or tomorrow, but forever. Amen.